Although it was eight months ago, I still remember it like it was yesterday. We were going over all the future phases of treatment with the doctor, and she warned us that “the last one, the maintenance phase, is a misnomer. It sounds like it gets a lot easier, but it is just… different.” Well now that Delaney is 1.5 weeks into this phase that will last a little over 1.5 years, we know what she meant by different. It’s different in a good way in that assuming her counts stay good, Delaney will go from weekly treatments in the clinic to monthly treatments. 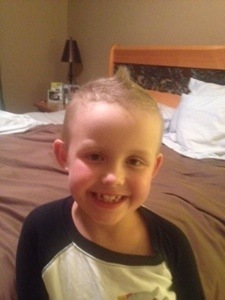 Different in a not so good way in that she is having to take chemo orally between treatments. Depending on the day, she has to take anywhere from 1 to more than 10 pills a day. Even worse than the chemo, the dreaded steroids are back. I’m sure it isn’t the same for everyone, but steroids really do a number on Delaney. She has to take them the first five days of the month and we definitely know when she is on them. Yes, she eats everything in sight (she jokingly woke up her Mommy last week by gnawing on her arm), but it is more than that. She gets these weird pains in her joints and also gets very emotional. She just doesn’t feel well when she is on them. As much as she loves going to school, she stayed home all last week while taking steroids. By the time the weekend came around, she was back to her normal studly self. She played hoops with her team on Saturday and on Sunday, basically turned into Rocky Balboa. It was a beautiful Colorado day, so after church we headed up to Red Rocks Amphitheater where we met some friends for a family workout. If you aren’t familiar with Red Rocks it has 69 rows of benches and exactly a gajillion steps. We jogged the steps, sprinted the rows, hopped with one foot of steps, then the other, then with both feet,did jumping jacks, push-ups, sit-ups, pull-ups, and then fell on our face… wait… that was just me. Delaney on the other hand would not be stopped or even slowed down. My friend had us do what he called the “Tough Mudder Trainer” where we started down at stage level and had to climb 20 stone walls to the top of the amphitheater. All the walls were taller than Delaney so I was worried about her falling backwards onto the concrete while trying to climb them. My fatherly instinct kicked in and I helped her up the wall each time just to make sure we didn’t end up spending the rest of our afternoon in the ER. She made it all the way to the top then ran all the way down the stairs to the bottom. When we were about an hour into the workout, Delaney yelled, “I’m going to do the Tough Mudder one again.” Before I could stop her or even catch her she climbed the first wall all by herself. And I thought there was no stopping her before that! Without any assistance from her old man, she tore up the 2nd wall, then the 3rd, then the the 4th, and so on. At the 17th wall her sister came over and said, “Dad, we’ve got to go!” At that point Delaney looked back at me and said, “Okay, you can help me with the rest of them.” All of this from a little 7 year old girl that not even 24 hours earlier had to take 8 pills of chemo. Simply amazing! Now that is something different! Delaney ended the weekend by running an errand with her mom. They went to the mall and were surprised to find that Santa was there. Even more different than Santa at a mall, was Santa at a mall with no line. 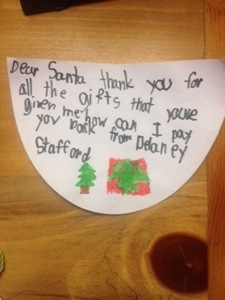 So, Delaney went and had a little chat with Santa. I don’t know exactly what she said, but I’m including a pic of a letter she wrote to him last night. Sorry for the double post for those of you on her facebook page, but her letter said, “Dear Santa thank you for all the gifts that you’ve given me. How can I pay you back? 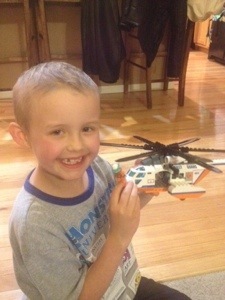 From Delaney.” Because I have been slacking on her blog updates, I’m not only including a pic of that but also a couple of pics from tonight (one with another of her lego masterpieces and the other proudly displaying a post bath mohawk— look at all that hair!!! ).